Designed by Airy’s Chief Assistant William Christie the direct-vision ‘half-prism’ spectroscope was constructed by Adam Hilger. During the day it was used to observe the prominences of the edge of the sun and the spectra of solar spots, in order to obtain records of their frequency and changes. At night it was used for visual determinations of the motions of stars in the line-of-sight by comparing certain lines in their spectra with those of different gases. 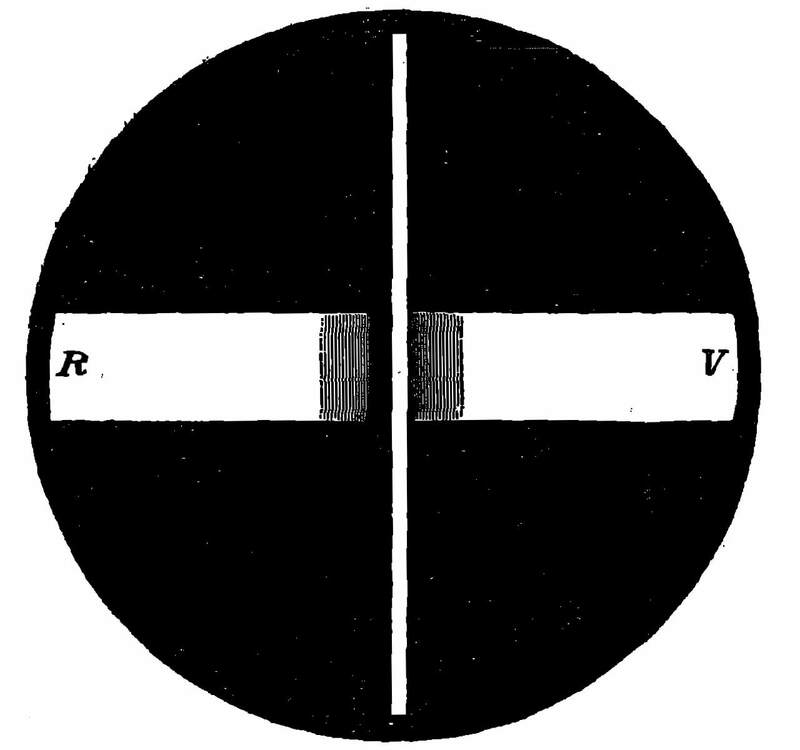 The spectroscope was used to measure the shifts in the spectral lines from their normal positions as a result of the Doppler Effect – a technique that had been pioneered by William Huggins who had used it in 1868 to determine the line-of-sight velocity of Sirius. The Greenwich programme which had started in 1875 with a spectroscope by Browning was formally discontinued in November 1895. It was carried out mainly by Maunder with some assistance from Christie. 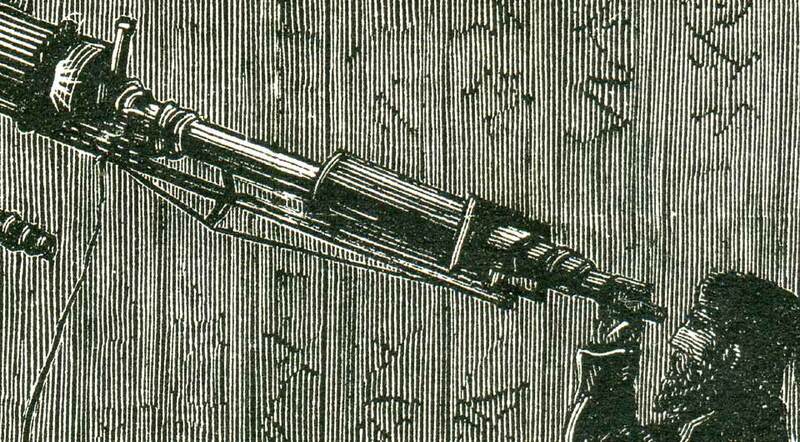 The ‘half-prism’ spectroscope was mounted on the 12.8-inch Merz Refractor in July 1877. The Merz, however, proved too small to allow anything but the brightest stars to be observed. 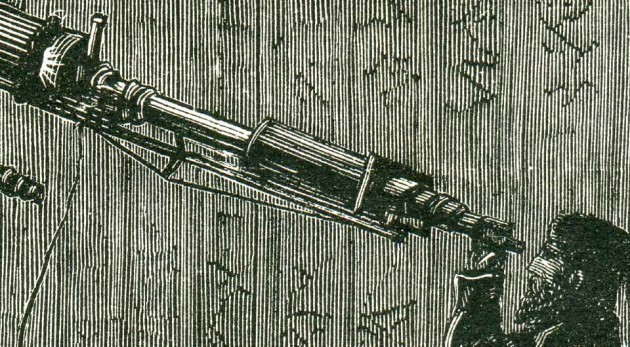 The Lassell Telescope which was acquired in 1883 was more powerful, but was unsuitable for spectrographic work as its mounting and clock-work were not capable of carrying a heavy spectroscope. Christie therefore set about trying to procure a larger refractor. In 1885, he secured agreement from the Admiralty to provide the funding to allow him to replace the Merz with a larger 28-inch refractor on the same mounting, the justification being that it was needed to allow the spectrographic work to proceed effectively. The spectroscope was dismounted from the Merz in 1891 when the telescope itself was dismounted. 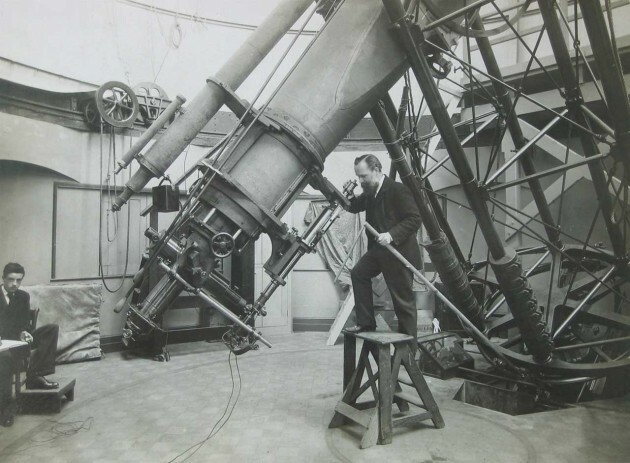 After some delay, the new telescope eventually became operational at the start of 1894, with the spectroscope being mounted that June. Later that year, a regular programme of double star observations commenced together with a limited programme of spectrographic work. The latter was abandoned in November 1895 supposedly so that Maunder could concentrate on the heliographic reductions. The real reason is more likely to have been that in the years between the telescope being ordered and finally delivered, it had become apparent that the way forward with this work would involve not visual line-of-sight spectroscopic measurements, but photographic ones. When it was mounted on the 12.8-inch refractor, light passed directly from the telescope into the spectroscope. Because of the much greater physical length of the 28-inch-refractor, such a mounting was not possible. The light path was therefore bent though 180º using first a mirror and then a prism and the spectroscope mounted below the telescope tube with its axis parallel to it. ‘The truth will have to be told some day. I may tell it. Mr Maunder was a very careful & competent observer. Had those observations been made with a proper spectroscope there can be little doubt that the results would have been very different to what they were. That detestable Half-Prism spectroscope which Mr. Christie (as he then was) designed & would not give up, – we considered brought discredit on poor Mr. Maunder, – & in some eyes on the Line-of-Sight Method itself. Why – there were nights when the same star – both approached & receded. Danced in fact most flighty – shamelessly flighty – manner! A description of the spectroscope was published in the introduction to each of the volumes of Greenwich Observations from 1877 until 1900. The written description changes slightly from one year to the next in the early years until 1883 when it became consistent from one year to the next. The description below is extracted from the 1897 volume. Click here to read it as originally published. ‘The direct-vision “half-prism” spectroscope, constructed by Mr. Hilger, has been used from 1877 July to 1891 November in connection with the 12.8-inch Merz refractor mounted on the Great Equatorial. In this form of spectroscope, either great dispersion or great purity of spectrum is obtained by the use of “half-prisms,” * according as the incident pencil falls first on the perpendicular or on the oblique face. Either one, two, or three “half-prisms” can be used at pleasure, according to the dispersion required, and each “half-prism” is compound, being composed of a flint “half-prism” and a crown prism cemented on the oblique face so as to form the half of a direct-vision prism, as cut by a plane perpendicular to the base. With one “half-prism” a dispersal of about 18½º from A to H, equivalent to that given by four flint prisms of 60º, is obtained, with two “half-prisms” a dispersion of about 80º from A to H, equivalent to that given by sixteen flint prisms of 60º, with three “half-prisms” a dispersion of about 300º, equivalent to that given by about sixty flint prisms of 60º, the pencil in each case being incident on the perpendicular face of each “half-prism” and emerging at the oblique face. For observations of the Solar prominences, where great purity of spectrum is desired, the slit and eyepiece are interchanged, so that the pencil is incident on the oblique face and emerges at the perpendicular face of each prism. The cross-section of the first prism is 2 inches in height by 2 inches in breadth, of the second prism 2 inches in height by 0.6 inch in breadth, and of the third prism 1 inch in height by 0.4 inch in breadth, the pencil being made narrower by the oblique emergence at each prism. The collimator and viewing telescopes have focal lengths of about 23.2 and 11.6 inches respectively with apertures of 2¼ inches. Different parts of the spectrum are brought into the field by turning the “half­prisms,” each through the same angle, about fixed centres, by means of a micrometer­-screw acting on a lever. For delicate measures a micrometer eyepiece is used. 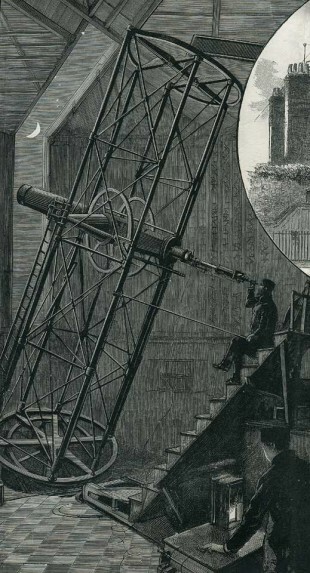 The spectroscope was mounted on the 28-inch refractor in 1894 June. It is planted with its axis parallel to the tube and below it (in the position for objects south of the zenith), the rays being thrown into the collimator by two reflexions, first from the mirror for diagonal view in the telescope tube, placed about 26 inches within the focus, and then from a small rectangular prism close to the slit and 24 inches from the axis of the refractor, mounted in an adapter carried by the sliding eye-end. The spectroscope is firmly attached to the telescope tube by strong castings with suitable collars, having sliding adjustment for focus, and allowing of rotation of the spectro­scope for orientation of the slit parallel or perpendicular to the equator. By this arrangement the spectroscope is permanently mounted on the refractor, the mirror in the tube being inserted for spectroscopic observations and withdrawn for eye-observations. Occasionally for faint objects another spectroscope of smaller dispersive power is used. This spectroscope has a. single prism of flint glass, with a collimator of about 20 inches focal length and a viewing telescope of about 10 inches. Ample provision is made of the necessary auxiliary apparatus; namely, a Sprengel air-pump, with Crookes’ improvements, made by Hicks; an induction-coil, by Browning; and a battery, by Ladd. The fate of the spectroscope is undocumented. The introduction to the 1900 volume of Greenwich Observations is the last published reference to it still being on the 28-inch refractor. It does not appear to be listed in the 1911 inventory (RGO39/4). Recorded in the 1926 inventory (RGO39/05/103) as being in the South Building (Lower Museum, Case H), its current whereabouts is unknown. The inventory does however record that the eye-end for adapting the spectroscope to the telescope together ‘various accessories’ were condemned (and presumably disposed of) in January 1930. The results obtained with the Spectroscope were published each year in the annual volumes of Greenwich Observations. Links to the relevant sections are given below. The results were also published in the Monthly Notices of the Royal Astronomical Society. No results were published for the years when it was used on the 28-inch refractor. Special thanks are due to the Greenwich Heritage Centre for permission to reproduce the photograph of E Walter Maunder with the half-prism spectroscope on the 28-inch refractor.